15 Smith's Buildings in 1916. Sidney was born in Newbury in 1896, the son of Francis Jones and his wife Kate Elizabeth née Goddard. The couple had five children: Joseph William (born 1892), Frances Carrie (1894), Cameron Goddard (1895), Sidney Walter (1896) and Elsie Violet (1899). By the time Kate filled in the family’s census return in 1911 she was a widow with only one son – Cameron died in 1895 within months of his birth (infant mortality was high), Joseph died in 1909 aged 17 within a day of his father. Francis was buried in Newtown Road Cemetery on 31 December 1909, and Joseph joined him three days later on 3 January 1910. However, Sidney still had brothers – half-brothers. He was a child of his father’s second marriage. In 1874 Francis had married Mary Emily Steward in the Portsea area; the couple had eight children before Mary died in 1889. The children were Alice Emily (born in Dibden, Hants, in 1874), Annie Kate (Hambledon, Hants 1875), Mary Bertha (Titchfield, Hants 1877), Fanny Edith (Theale, 1880), Francis Henry (Theale 1881), Maggie Winifred (Theale 1883), Rose Gertrude (Theale 1885), and Thomas Edward (Theale 1886). Mary died in 1889, and Francis married Kate in 1891. Francis was a police constable, first with the Hampshire Constabulary, then the Berkshire - he was a well-known and well-respected member of the community. His death hit the family hard as shown by the move from new housing at 12 Connaught Road to one of the town’s decaying back alleys - Brixton Rise off Cheap Street, where they lived at No 5. Most of the elder children from Francis’ first marriage had left home by this time; only the youngest, Thomas, was still there at the time of the 1911 census. Sidney was a bright lad, earning a place at Newbury Grammar School which he attended from 1908 to 1911. He then found employment as a clerk at Edward Gould’s grocery store in Cheap Street. Francis junior opted for a military career, joining the army at the age of 16 (in 1897) and serving with distinction in the Boer War. Tom opted for military service of a different sort by becoming valet to Major General Francis Lloyd, commander of the Welch Division, Territorials. Lloyd was promoted to Lieutenant General and was the GOC (General Officer Commanding) the London Division during WW1. Tom may well have been a Territorial while working for Lloyd, but sadly his name is a very common one and his service record has been destroyed. All that is known is he served on - and survived - the Western Front and rose to the rank of Sergeant Major. 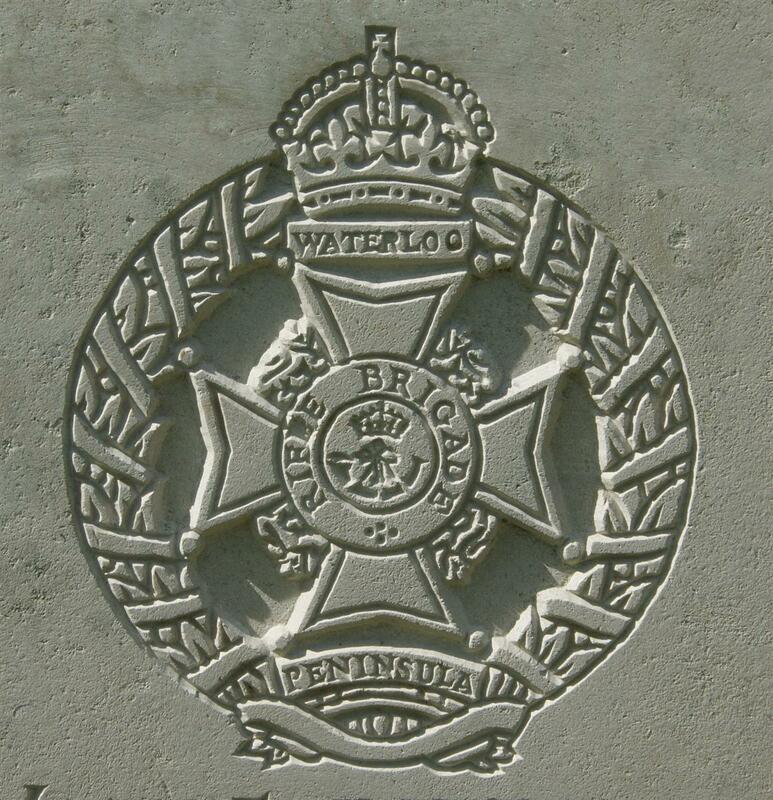 The regimental badge of the Rifle Brigade, as used on CWGC headstones. Sidney was not slow to sign up once war was declared; he joined the Rifle Brigade and, once trained, was posted to the 2nd Battalion in France in October 1915. At 2.30am the enemy opened a heavy bombardment on our front line & support trenches. Our guns replied. Casualties – four killed, 6 wounded, two of whom died from the effects of wounds same day. The Battalion was relieved in the trenches by the 8th Bn York & Lancs Regt during the afternoon and marched to Camp in Henencourt Wood. Divisional Reserves. One of the six wounded, one of the two who died later in the day, was Sidney. He was taken to a nearby Field Ambulance (a forward hospital facility) near Millencourt, where he died. 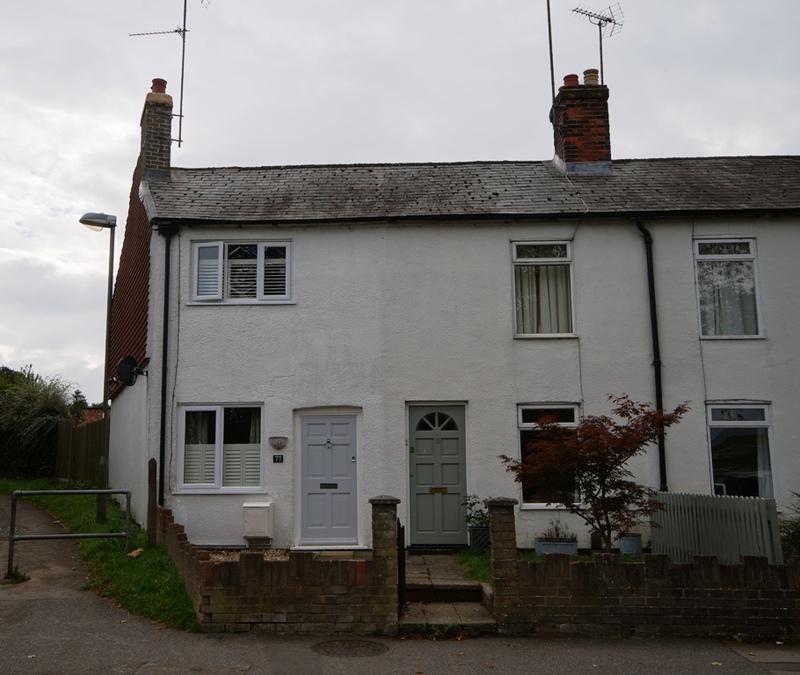 In ever loving memory of Rifleman S W Jones, who was killed in action while serving with his regiment, the 2nd Rifle Brigade, only son of Mrs Jones, 5, Brixton Rise, Newbury, aged 19 years. For somewhere in France our dear on is sleeping. From his sorrowing Mother, Frances and Elsie. Sidney was buried in grave B.2 at Millencourt Communal Cemetery Extension. Locally Sidney is remembered on tablet 3 of the Newbury Town War Memorial, the memorial board and roll of honour in St Nicolas’ Church and on the Newbury Grammar School Memorial now located in the reception area of St Bartholomew’s School. Above his name on the town memorial is that of his half-brother, Francis, who died in France in September 1917. His story is told here. In ever loving and proud memory of Sidney Walter Jones, dearly loved only son of Mrs Jones, 5, Brixton Rise, Newbury, of the Rifle Brigade, attached Machine Gun Section, who died in France May 21st, 1916, aged 19 years. For the sorrow it has caused us all. From his sorrowing Mother, Mr and Mrs Bert Harvey, and Elsie. JONES – In most proud and loving memory of Sidney Walter Jones, dearly loved only son of Mrs Jones, 5, Brixton Rise, Newbury, who died of wounds in France, May 27th, 1916, aged 19 years. – RIP – From his loving Mother and Sisters, and Rifleman Bert Harvey, BEF, France. Sidney’s mother did not outlive him for long; she died in October 1919 aged 57. Note: The Bert Harvey mentioned in these In Memoriam entries was John Albert Harvey, who married Sidney’s sister Frances in 1915.